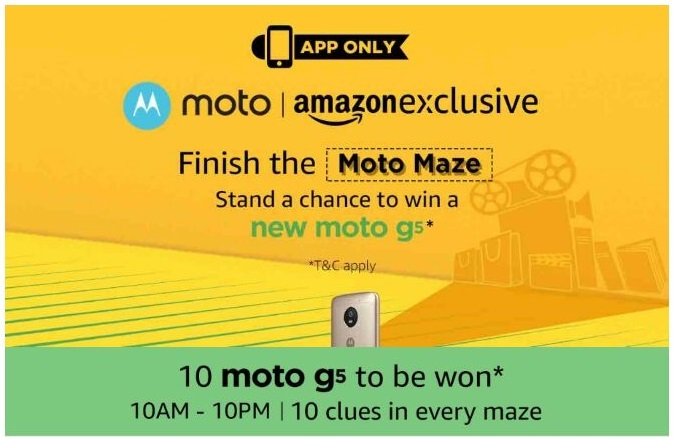 Amazon moto maze contest are held on amazon India.Solve the clue and get a chance to win 10 moto G6. All the answer are added . 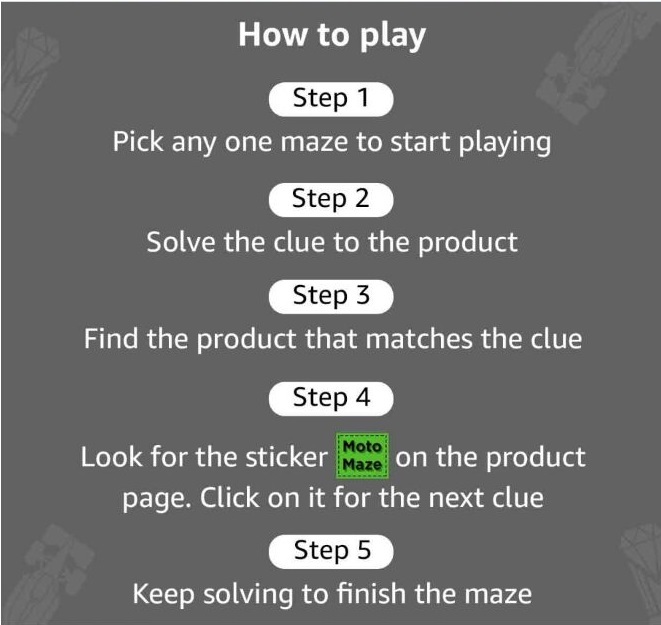 Get the list of the products and try to solve the clue. This contest started from 10AM and end at 10PM. You can easily win if you able to solve most of the answer. Here we will add some products list. Please comment the Products Name. Help each other . Comment below. How to play Moto maze contest? It is very easy.Follow the steps carefully and get a chance to win a new handset. If you find Moto Maze image like this. It is all done. Find more products to win Moto G5. Clue 5: "Not all those who wander are lost"
Clue 6: Don't just relax. Laze. Clue 10: Also the name of a candy that has taken India by storm in recent years. 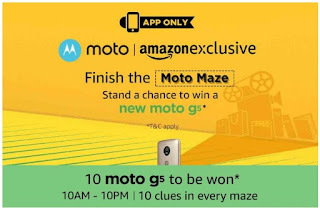 This Moto Maze contest ("Contest") and the benefits/ prizes hereunder are provided to you by Motorola Mobility India Private Limited ("Motorola/"Brand") and made available on the mobile application of www.amazon.in ("Mobile Application") by Amazon Seller Services Private Limited ("Amazon" / "ASSPL"). Please read these terms and conditions ("T&Cs") before entering the Contest. These T&Cs are in addition to the Conditions of Use to which you agree by using the Mobile Application. To the extent the Mobile Application's Conditions of Use are inconsistent with these T&Cs; these T&Cs will prevail with respect to the Contest only. Notwithstanding anything contained herein, Amazon shall have the right to revoke these T&Cs from the Mobile Application at any time without any prior notice. This Contest will commence for a time period starting from 10:00:01 am to 21:59:59 pm IST on April 04, 2017("Contest Period"). In order to be eligible for the Contest, during the Contest Period you must sign-in to or sign-up from an account on the Mobile Application and navigate to the event page. In order to participate in the Contest, a participant must choose between the two methods of playing i.e. the ‘entertainment maze’ or the 'professional trail'. Each method will direct you to a different page on the Mobile Application. 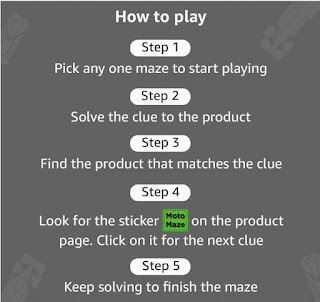 This page (of the respective maze) will further show one clue in relation to a product listed on amazon.in and you will be required to go on the product page (which the clue hints about) in order to get the next clue. Thereafter, each clue will lead you to other clues. Each maze i.e. the 'entertainment maze’ or the 'professional mazes' will have its separate set of clues (10 each). For the purposes of participation in the Contest it is clarified herein that only maze trail i.e. the first maze chosen by the participant will be considered. At the end of the Contest Period, a total of 10 participants (5 participants from each maze) will be declared as winners amongst the participants who fulfil the steps mentioned above. In case of a tie amongst the participants who have earned the same points, winners will be selected basis a random draw of lots. Such selected winners will receive an e-mail notification from Amazon with a Contest question and will be required to follow such other steps as mentioned in the e-mail. If the selected winners answer the Contest question correctly and follow the steps mentioned in the e-mail, the winners will be entitled to win a Moto G5 mobile phone (64GB) each (hereinafter referred to as "Bumper Prize(s)"). Each participant will be eligible to receive either one Bumper Prize or one Prize under this Contest. By entering the Contest, you consent to being placed on a mailing list for promotional and other materials for Amazon Seller Services Private Limited ("Amazon"/ "ASSPL"). You may update or change your email preferences at the email preferences page. There are a total of 10 Bumper Prizes that will be distributed under this Contest i.e. 1 Bumper Prize to each winner of the Contest. The Prize will be provided to the winner(s) on or before 30th April, 2017 by the Brand. The drawing for selection of the winner of the Contest will be aggregated at the end of the Contest Period. We will notify the selected participants by e-mail following the draw, and they will be required to share a valid proof of identity and age in the form of a copy of PAN Card / Driving License / Voter ID / Indian passport. A PAN card copy is mandatory for prizes worth INR 10,000 or more. The selected participants will automatically forfeit their claim to the Prize if they do not meet the eligibility criteria or do not comply with these T&Cs. Each Prize will be awarded by the Brand "AS IS" and WITHOUT WARRANTY OF ANY KIND, express or implied (including, without limitation, any implied warranty of merchantability or fitness for a particular purpose). There are no cash or other prize alternatives available in whole or in part. However, in circumstances beyond our control, we may substitute a similar alternative prize of equal or greater value in our sole discretion. If any selected participant does not respond back to any communications sent in relation to the Contest within the time period communicated by Amazon, or answers the Contest question incorrectly, he/ she shall not be eligible to be declared winner of the Prize. The selected participant will also be required to prove his/ her age, failing which he/she will be disqualified from the Contest. In such cases, another participant will be selected by a random draw of lots who will further be required to answer the qualifying question correctly within a time period which would be communicated to the selected participant by Amazon, in order to be declared winner of the Contest. Brand may, to the maximum extent permitted by applicable law and in our/ its sole discretion, change the T&Cs or cancel the Contest at any time; or modify, terminate, or suspend the Contest should viruses, worms, bugs, unauthorized human intervention or other causes beyond our control corrupt or impair the administration, security, fairness or proper play of the Contest or submission of entries. We/ Brand may, in our/ its sole discretion, disqualify any individual found to be: (a) tampering with the entry process or the operation of the Contest or website or mobile application; (b) acting in violation of these T&Cs; or (c) acting in an unsportsmanlike or disruptive manner or with intent to annoy, abuse, threaten or harass any other person. The Contest is governed by the laws of the Republic of India. The Contest and all accompanying materials are © 2017 by ASSPL, or its affiliates or by Brand, as the case may be. All rights reserved. No requests for transfer or assignment or redemption of the benefits shall be entertained. You agree that all our/ the Brand's decisions related to the Contest are final and binding on you. Failure by Amazon/ the Brand to enforce any of these T&Cs in any instance shall not be deemed to be a waiver of the T&Cs and shall not give rise to any claim by any person. The decision of Amazon/ the Brand shall at all times be binding and final. These T&Cs are subject to Indian laws and the courts at New Delhi shall have the exclusive jurisdiction in respect of any disputes or any matter arising here from. This Contest is being made purely on a "best effort" basis and participating in this Contest is voluntary. By participating in the Contest, you will be legally bound hereby, to release from liability, and hold harmless ASSPL, and any of its affiliates, employees or agents representing or related to ASSPL and its services/products for any matters in relation to the this Contest, including the Prizes provided by the Brand. This release is for any and all liability for personal injuries (including death), property loss or damage, and misuse of the benefits/ Prizes offered under this Contest, in connection with any activity or directly or indirectly, by reason of the acceptance, possession, or participation in the Contest, even if caused or contributed to by our negligence. 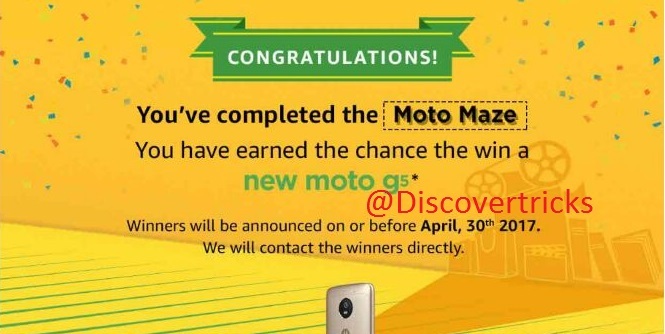 The sponsor of this Contest and the Prizes provided hereunder is Motorola Mobility Private Limited, a private limited company having its registered office at Gurgaon, Haryana. All information submitted in connection with this Contest will be treated in accordance with these T&Cs and the Privacy Notice available at the Mobile Application. what is bulls and bears, cant find anything..